I hope you are enjoying the beginning of summer and have planned some fun and relaxation. Congratulations to all Miami Beach students on their recent graduations. I wish you much success in your future endeavors! Speaking of schools, they were front and center in our Miami Beach Commission at our June meeting. 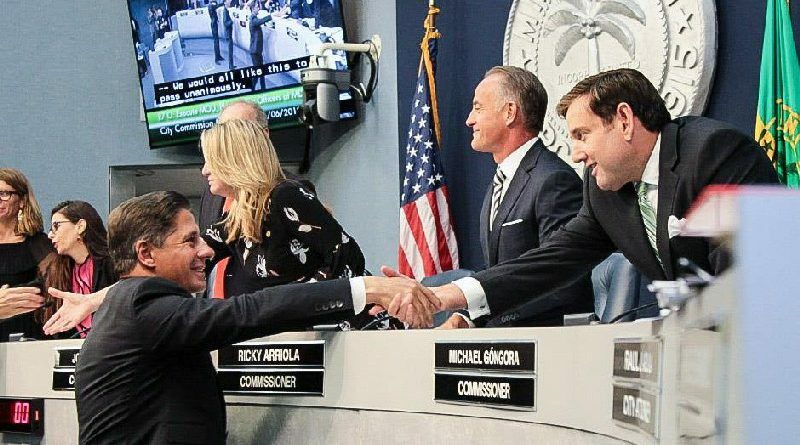 Resulting from the most prominent discussion, the Commission unanimously voted to place an armed police officer at each of the six Miami Beach public schools. In doing so, Miami Beach is the first city in Miami-Dade County to authorize funding this $1,000,000.00 a year expense. While approving such a large expenditure is never easy, the safety of students and the peace of mind of parents is paramount. Your Miami Beach Commission is dedicated to keeping our City and our students safe. Miami Beach Commissioner Micky Steinberg and I co-sponsored new legislation in Miami Beach to protect animals. After the horse incident in a nightclub and a tiger at a prom, we felt that specific legislation and penalties were needed to highlight that mistreating animals is against the law in Miami Beach. Horses and other non-domesticated animals should not be used to entertain revelers in nightclubs and at parties. However, there is an exception for properly permitted events such as Miami Beach Polo, where animals are trained for the sport. Mayor Gelber and I co-sponsored legislation regulating plastic bags and plastic straws. While the plastic ban ordinance had previously been passed by the Commission it has been stayed pending the outcome of the appeal of a similar Coral Gables ordinance. The Commission unanimously agreed to lift that stay and move forward with the ban. We also introduced legislation banning the use of plastic straws and stirrers in City-owned buildings and sidewalks. While we await the second reading of these two ordinances, we instructed the administration to start an educational outreach program to businesses so that they will not immediately be fined once the ordinances take effect. For the past two months, the City Commission has spent much time discussing the flood mitigation program in the Stormwater Master Plan and how to implement it. The Stormwater Master Plan was passed by the Miami Beach Commission in 2012 when I previously served and sets forth a program for performing underground repairs, replacing/repairing pipes with larger ones, improving drainage and raising roads. Fueling these discussions was my motion to reject a $24,000,000.00 contract for specific work in a mid-beach neighborhood based on legal concerns. While that contract was rejected in a 5 -2 vote, I believe the Commission remains largely united to moving these stormwater projects forward in a responsible manner incorporating the best and latest recommendations from experts. We will get these projects done the right way! In closing, I wish all of the fathers and grandfathers a Very Happy Father’s Day – especially my own. Happy Father’s Day Alberto Gongora! The Land Use and Development Committee met on June 13, 2018. The main hot topic was the North Beach Town Center (TC) Zoning Districts. On November 7, 2017 the voters of the City of Miami Beach approved an increase in Floor Area Ratio (FAR) to 3.5 for the area of the TC district bounded by 69th Street on the south, Collins Avenue on the east, 72nd Street on the north and Indian Creek Drive/Dickens Avenue on the west. At the Land Use meeting, City Administration was proposing height increases and reduced setbacks that would upzone the entire district to 125 feet in height with the option of obtaining an additional 75 feet through public benefits. This would allow for up to 200 feet. The development community is seeking an additional 20 feet, or to take the potential height up to 220 feet. Almost everyone present at the meeting was supporting the upzoning. I am concerned, however, that the North Beach Master Plan always recommended up zoning to 125 feet. Since the administration is now recommending a significant height increase and other changes from the North Beach Master Plan, the committee members voted to move the item with no recommendation to the Planning Board for input and then come back to the Land Use Committee for further discussion before going to the full commission. If you are interested in participating in this discussion there are numerous options including the June 27th Commission meeting when the item will be scheduled to be referred to the Planning Board; the July 24th Planning Board meeting; and then the July 31st Land Use and Development Committee meeting. We welcome your participation and input. A: No. The Florida Condominium Act requires that board meetings be properly noticed. Other than certain specific board meetings, such as board meetings to levy assessments or adopt rules regarding unit use, the notice must only be posted at least 48 hours before the meeting on the condominium property. Further, owners are entitled to attend meetings and may speak at the meeting as to all designated agenda items. The statute contemplates that the meetings will take place at a specific location and that notice of that meeting need only be posted on the condominium property. The statute provides that board members may participate in a meeting via telephone, video conferencing or similar real-time electronic or video communication, and such participation counts towards the quorum. Board members participating by remove means may vote as if they were physically present in the room. The Condominium Act does not mention unit owners attending board meetings through remote means. While the board can allow board members to participate or remote means, there is no legal requirement to do so. I am aware of a few associations which allow owners to call into board meetings, but it is certainly not the norm.